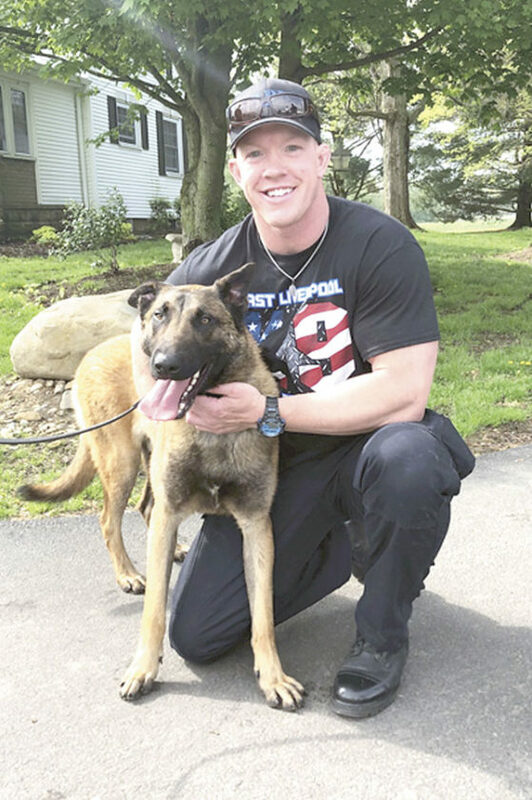 EAST LIVERPOOL — The city’s newest K-9 officer and his canine partner were both injured Saturday while attempting to take into custody a suspect who was also injured during the arrest. Handler Chris Green suffered an injured finger while his canine partner Nero received unspecified injuries that required him being X-rayed by his veterinarian, while suspect Dacious D. Coles, 22, Wilbert Avenue, was treated at East Liverpool City Hospital for bite wounds, according to Chief John Lane. According to reports, Coles was wanted on a felony warrant and had run from Green the previous night. On Saturday, Green received word that Coles was at a house on Avondale Street, after which another officer reported seeing someone matching Coles’ description run into the house at 1110 Avondale. The occupant, Josh Brooks, denied Coles was there, asking officers if they had a search warrant, but then later gave consent to enter the home. Green reported announcing he had a canine, resulting in Cheyeanne Gorby, 20, Ravine Street, coming out with her hands up after a second announcement. She initially denied knowing if anyone else was inside, then after being detained, reportedly said Coles was hiding inside in a closet and she didn’t want him to get hurt. Gorby was charged with obstructing official business. Green reported he “pleaded” with Gorby to tell officers if Coles was inside to avoid him being bitten by Nero. After a fourth announcement, Green and his partner entered, and the canine was released, alerting on an attic closet. Green reported he gave multiple commands for anyone inside to come out but no one did, and Nero was then released into the attic, where he suddenly fell through the floor onto the first floor of the home. Unfazed by the fall, according to Green, his partner tried to climb back into the attic but it was too high, so Green placed him back up into the attic, where he “showed great interest” in an area that had also attracted the officer’s attention. Coles was seen hiding behind a wall of insulation and, although Green reportedly told him to come out, he refused. Green reported he saw Coles grab Nero around the neck, using his right hand to grab the top of the dog’s snout while twisting his neck, and covering his nose while twisting the canine’s neck. Green reported that he “frantically crawled through the attic to assist Nero and keep him from being injured,” removing Cole’s hands from his partner’s head and neck. Nero continued trying to apprehend Coles as the suspect continued to fight and hurt the canine officer, according to reports. During the struggle, Green fell through the attic floor to the first floor, with Nero falling through beside him as he continued to hold onto Coles, who still refused to come out of the attic. Nero released Coles, who was given several commands to come out, but failed to comply, even after a Taser was used on him, according to reports. Officers ultimately had to pull Coles out of the attic as he continued to resist, trying to crawl to the side door. He was handcuffed and taken into custody, and Green reported he quickly exited to check Nero’s injuries, contacting his vet and rushing him there for treatment. While doing so, Green reported, he realized he, too, had an injury to his hand and finger. In addition to the warrant, Coles was charged with assaulting a police dog, obstructing official business, resisting arrest and false information. He appeared Monday in East Liverpool Municipal Court, where a second arraignment was set Sept. 24, with $20,000 cash/surety bond set. Gorby was also in court Monday, with a pretrial scheduled Oct. 25 on the obstructing charge. Chief Lane reported Monday night to city council about the incident and the fact that Nero had to have X-rays for his injuries but that they “came out clear” and he won’t miss any work. Green, he said, “is stubborn, to say the least,” and will also be back on the job today despite his injured finger.